Amazing accommodation, looked better than the pictures, we moved here after checking out of our previous accommodation early as it was horrible and what a relief it was to come here! We arrived really early and were allowed to check in as the room was free which was a bonus! There was even beach bag, beach towels and slippers and robes in the room - really nice touch! Super clean and really fast WiFi! There was also a Tv, cable, fridge and kettle! The owners were really amazing and really helpful and really honest as well and it always felt like they had your best interests at heart! Would recommend to anyone, really great price for what it is and only 5 min walk to Haad Yao beach which is really lovely and sandy with clear waters! You get motor bikes in really good condition, taxi services and laundry prices for the usual island fee. the only thing we didnt like was the huge rule book that comes with staying at the place. When checking in the owner tells you about a lot of things on what not to do. E.g. going to bed with sun creme because it can cause stains apperently. While this might be true it is unnecessary to mention and dampens the holiday feeling. I can understand that the owner wants to look out for their property but to us - as guests who treat the room always with biggest care - it just ruins the big "wow"-moment when reaching a new destination. We spent a delightful time at the resort. The owner is wholeheartly welcoming and helps you with every wish. The bungalows are spacy and clean. You can eat at the resorts own restaurant and rent excellent scooters at the accomodation as well. Sun, moon, star was a fantastic place to stay. The staff were all really helpful and their taxi service was excellent. The room was always really clean and the bed was super comfortable. We had the best nights sleep out of everywhere we stayed! clean, the food is amazing, the office/restaurant has a great view. I cannot recommend this place enough, the owners are kind, truthworthy and good people. I travelled solo and got into a spot of trouble due to an accident, they looked after and out for me with no complaints and seriously helped me out when I really need it. Stayed here for over 10 days in total, came back twice. 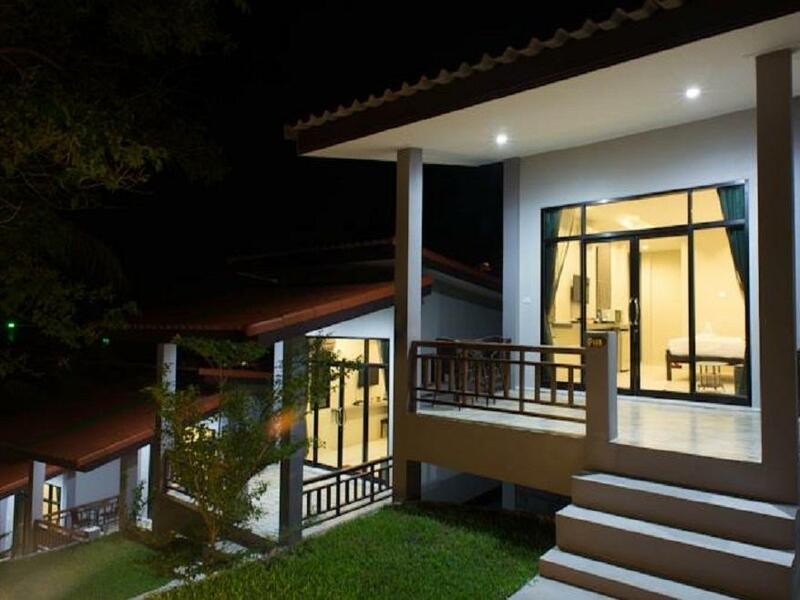 If the intérior of the bungalow is very clean and well equiped, the access of the bungalow with hard stairs is not comfortable mainly for these down of the Hill. From the bungalows we have no view as in the forest and the hill is not well tend. When you take your breakfast on the terrasse the boy continue to sweep the leaves with dust around wich is not very pleasant and we are obligéd to ask stopping. The resort is not very far of the beach (10 minutes) but with à motor bike you have access to the various part of the Island. For the same price we can find many ôther resort near of the sea. Dear Michel, First, we thank you for your reservation with our hotel again and thank you for your review but some of your comments require clarification. You came to our hotel the 2nd time and you know, you see our location. Since we receive your reservation you need the same room but we alreay reply to you that we can't guarantee because we have only 10 rooms and this period is high season. Also in the website we have the picture so clear about the step for each room. This room we have our guest are like and love and stay at least 3 wk or 1 month but they never came and complain. For sure in the morning we have the staff to clean around our location to clean a part of leaves and in the morning no wind and we believe no dust and not effect with your foods. In the island they have many hotel that you say and why you do not choose the another hotel instead of our hotel. We hope we will be not see you again. Actually we would like to run our business by roughly. We stayed at the Sun Moon Star Resort for 4 nights. All in all it was a pleasant stay. It was certainly one of the cleanest accomodations we stayed at (no bugs in the room). We loved the Haad Yao Beach, which is in walking distance of the resort. The only really unpleasant experience was that they lost one of my long trousers in the washing process. Unfortunately I only realized it in the next resort (it's so hot you rarely need them). When calling the lady of the resort it would have been nice if she said: "we will have a look for your trousers" instead of the rather unpleasant reaction I received. Also we would have felt more welcomed if the owner was a little bit less overprotective when checking in (as mentioned in previous reviews). I guess we just did not click. Lovely owners were very welcoming, room was perfect for us as the sofa bed suited our 2 year old well. The beach is a short walk and is definitely one of the best on the island for kids as it is very shallow for a long ways out. There is no pool which was too bad, however I prefer the ocean anyway and with this beach so nice there is no need for a pool. Breakfast was great and made to order - your choice of 4 or 5 options. We liked it, it was in the quiet area. Very convenient to rent a scooter to reach out the nearest beaches and beautiful places of the west part of Koh Phangan. It was awesome to have a breakfast with this view and calm atmosphere. Staff were great, rooms lovely . Food was homemade and delightful. You need transport to get around, but that could be said wherever you stay on the island. Beach bars and massages brilliant. Can't wait to go back. Rooms are very clean and tidy. Staff is incredibly friendly and takes always very good care of guests. Very welcoming atmosphere and very good in giving one tips what to do and how to explore the island! The owner (2 sisters) are the good hearts of this place and they do a lot to please their guests although it's not a 5* hotel! I can recommend all kinda food in the restaurant! Delicious! You ll not regret your stay here. But don't expect it to be a high class boutique facility although it's a very nice and good place ! Hotel is well located with 5 mins walk to the beach and a good view. Spacious, clean room with air-con,hot water, fridge, micro-wave, and water boiler. The closest beach is also great with light blue water, not so much crowd. This hotel is runned by 2 sisters' families. They are both very nice and helpful. We like this hotel. The staff are very friendly and the rooms are decorated to a high standard. There is also plenty of things in the room to use such as a bath robe, slippers, 2 umbrellas toiletries etc. Unfortunately I lost my key while out and I returned after midnight and there was nobody at reception and nobody to give me access to my room. I lost my 1000baht deposit which is understandable. Also, I left my bathroom light on throughout the night and the ceiling was full of moths. This was my fault though. All in all I would return. It's also a little over priced. My stay, while satisfactory is not what is worth writing about. It is what happened afterward. Having checked out, taken the taxi to Thong Sala, eaten lunch and boarded the ferry which was about to depart, the driver who had brought me from the hotel somehow found me on the boat and told me I had left my passport in the room safe. He then talked to the staff of the ferry to allow me to switch to a later departure and brought me back to the hotel to retrieve my passport(and cash). How he managed to find me in the boat I will never understand, but I am incredibly thankful he did! We staye for two weeks and we loved it. The staff are so friendly and helpful, lovely people. The food in the restaurant is made fresh, no frozen ingredients, no shortcuts - and it's reasonably priced. The room was cleaned perfectly well every day, there was no noise, no annoyances. We have absolutely nothing to complain about. The value for money here is great. Again, the staff are so friendly and nice, they'll help you with any concerns or questions you may have. This is a very nice place to stay, the atmosphere was great and the facilities were well taken care of and everything was kept nice and neat. While you're there, try the "Noname vegetable burger." Delicious! This immaculate 2yo resort simply cannot be faulted. The room is large with everything you would expect to find in a 5 star resort - slippers, bathrobe, tea making facilities, safe, umbrella, flat screen TV, DVD, good wifi etc.. The bed is huge and soft and has 4 pillows, the bathroom the size of a ballroom with rain-shower head, there is a couch, and the balcony is huge. I love the jungle setting with sounds of birds, cicadas and monkeys, but the beach is just down the road, and you get ocean views from the restaurant and balcony. On and her staff go the extra mile in service. But I like small quiet resorts in an environmental setting and the two days of rain was amazing. If you want action, well it's just around the corner at the busy Haad Yao beach scene. Simply the best room on the island. I've travelled in over 20 countries and I have never done a review before, but Sun Moon Star deserves my praise. This is my favorite place. Period. The rooms are individual, absolutely stunning, and are more like small cottages-- but very new and modern, but with lots of charm. The staff will treat you like family, and go above and beyond for their guests. I live in Palau and this room would cost hundreds USD there-- even in the states this room would cost way more than they charge-- the value is excellent-- unbeatable . And you'll never find better staff-- extremely nice people-- drove me when I needed a ride, helped me out whenever I needed it. Food is excellent there too. 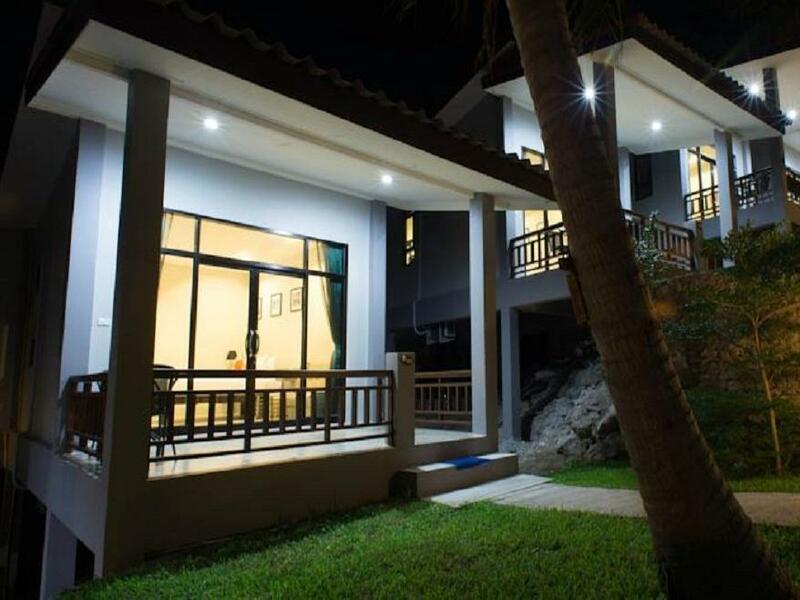 -- I would highly recommend Sun Moon Star to anyone - couples, families, groups or solo travelers like me.this is the one hotel that is actually better than the pictures and the reviews on agoda-- I would absolutely give Sun Moon Star the highest rating--the rooms / cottages are perfect. Like I said, modern but very charming, wonderful patios to sip coffee, brand new everything, beds are ultra clean and comfortable. It is also extremely close to Haad Yao beach (just walk down the path) - that's the best all around beach on Koh Phangnan. Stuff to do, good establishments - but not over the top. The staff is family and they will make sure anything you need or want is taken care of. They speak good English and can arrange anything you need.